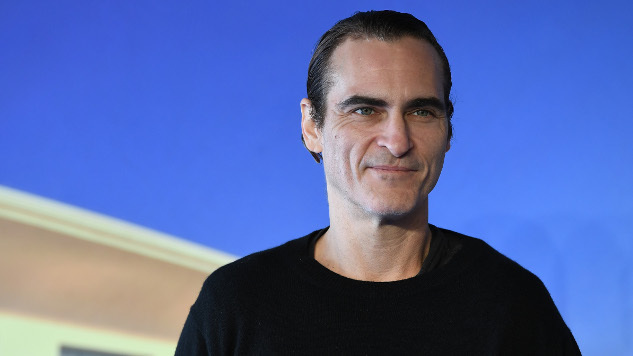 We’re getting our first look at Joaquin Phoenix as The Joker in a forthcoming Scorsese-produced, still-untitled origin film, courtesy of director Todd Phillips’ Instagram, and at least for now, he looks … pretty chill? A clean-shaven Phoenix appears, sans makeup, in the Instagram post, captioned simply, “Arthur,” as in Arthur Fleck, which is reportedly the Batman villain’s name before his becoming The Joker in the origin film. It’s an curious look for an actor like Phoenix, who’s done strong work playing restless oddballs like The Joker in such films as Paul Thomas Anderson’s The Master. And it’s a particularly strange take for such a showy role as The Joker, which brought out an electric, bravura final performance from Heath Ledger in The Dark Knight and also inspired Jared Leto to behave like a Pixy Stix-addled Hot Topic junkie during his press cycle (and couple minutes of screen time) in Suicide Squad. Obviously, soon enough we’ll get to see Phoenix in full form as The Joker, but for now, it’s welcome to have such an understated take on the character two years after Leto in Suicide Squad. We probably don’t need a Joker origin film in the first place; the defining attribute of the character is that we don’t know what motives him or where he comes from. But if DC Films (not connected to the DC Extended Universe of Suicide Squad, Justice League, etc.) absolutely feels the need to bring us one, it’ll hopefully at least be one with a bit of good taste. Along with Phoenix’s Joker, the forthcoming film will also star Robert de Niro, Atlanta’s Zazie Beetz and Marc Maron. Alec Baldwin was attached to play Thomas Wayne for—no joke—about 48 hours before dropping out. Insiders tell Variety that the story of The Joker’s origins in the film will resemble Scorsese’s The King of Comedy, also starring de Niro, about a failing comedian who kidnaps a talk-show host to become famous, albeit with de Niro playing the role of the talk-show host in Phillips’ forthcoming film. The Phoenix-led Joker origin film is set to release on Oct. 4, 2019.